Let us devise demands. Let us occupy public space. Let us engage true democracy. Let us honor our ancestors, and all struggles for justice which precede us. Let us come together and work to find the common goals which may unite us. Let us move from conversation to action. 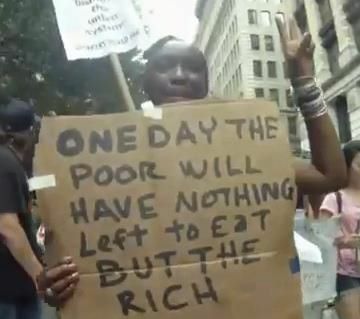 Also, please check out the information, incredible analyses and calls to action at People of Color Occupy Wall Street. Thanks for sharing your article, I really appreciate some of the points you make, and the conversations you’ve helped to start. I think where I most concur with you is in the hopefulness you express about what the events of Occupy Wall Street and related demonstrations may potentially lead to, which is a feeling I also share. The reason I have been excited about the movement is that, while I certainly feel there is need for reflection, criticism and alteration, I also feel that though Occupy X may be a small step towards the larger and more grounded changes many of us hope for, it is a step in the right direction. Political “movements” in recent years which have been dependent on corporate funding and have put more focus on supporting legislation and political candidates than on militant and vocal advocacy for oppressed communities have made me rather depressed. I am thrilled to see even the potential for a movement which draws links between multiple struggles for justice, and does so through occupation, claiming public space, and physically interrupting the flow of big-business-as-usual. I hear your comments and respect your perspective, and think that we should all remember as we continue working at better organizing and imagining our movements that European philosophers are far from the only people to have lived with, grappled with, resisted, critiqued and challenged global capitalism. We, in the broadest sense of the term, are all witnesses to the destructive economic order in which we are the captive participants, and I think the most radical thing we can do is to trust in our own ability to understand it, call it out, and work collectively to imagine both its downfall and the more just systems we envision replacing it. You call the Occupy X demonstrations taking place around the country “copycats” of the original Occupy Wall Street. I have some questions for you here: Doesn’t a larger movement to occupy multiple spaces show that we understand the reach of these oppressive organizations to extend beyond simply lower Manhattan–to, indeed, be a national and ultimately global phenomenon? Even if we are calling out specific organizations and not the entire economic order, is that an okay place to start? How do we expect to build a movement if we call the people who join in with us copycats? Thank you for your comment and appreciation. I am glad that there are others who share my perspective. I understand that to call them “copycat” movements sounds a bit dismissive. Of course certain tactics should be adopted and implemented more generally, on a wider scale. It would be just as unfair for me to dismiss the Bavarian and Hungarian workers’ councils that sprouted up in 1918 for “copying” the example of the Petrograd Soviet (and other Russian Soviets). So your point is well-taken.